"Charlie" was a gift to my wife for a graduation present. I'm a nut for doing research before I make any investment, especially when it involves a long term commitment. Terry and I were looking for an American Field Lab. 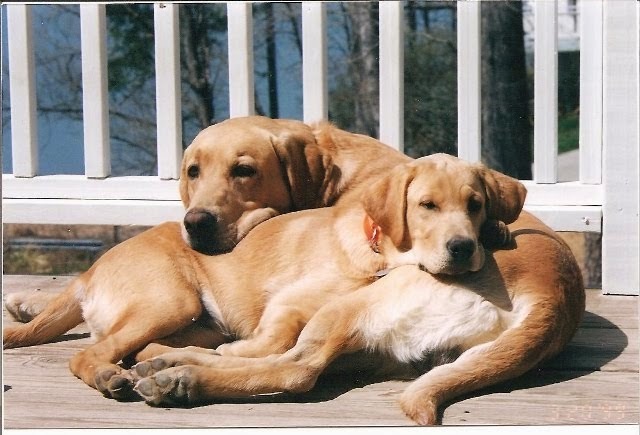 We looked on the internet for several months and found a lot of breeders that claimed they had the American Field Lab and to my surprise the majority of them had a cross between the English and the American Field Lab. Terry came across Hat Creek Farm and I did my research and Jean had the quality of lab we were looking for. After talking with Jean we knew our search was over. "Charlie" was born 3/04/2013. Having a good temperament, and just being part of the family was important to us. It was just a bonus that they were also bred for hunting and being used in search and rescue. This takes a very special blood line to be able to do that- I know because I have several hunting dogs. 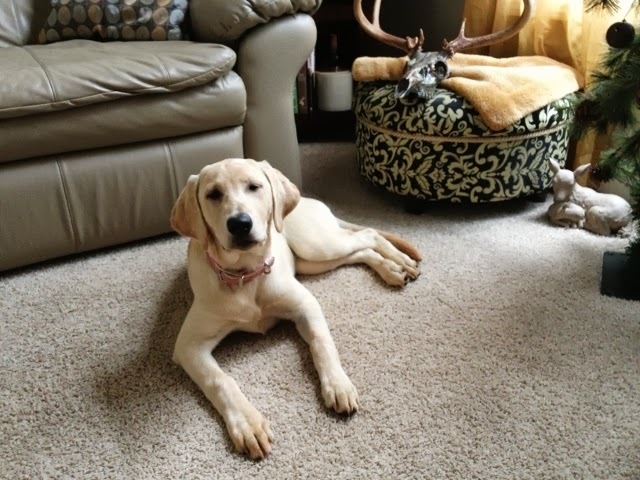 Charlie is a yellow female American field Lab, from day one she has been crate trained and at 12 weeks we had her trained to sit, lay down, stay, and not pulling on a leash. She is very close to being able to walk by me off leash. When we feed her next to our other lab, Hunter, I give them a wait command and get them to stay before they eat. It takes a very intelligent dog to do that and at such an early age! Our vet even mentioned she sees a lot of labs and is impressed with Charlie's intelligence. I think Charlie understands the English language! I know from raising puppies the personal care you give them is unbelievable and it makes them very special. I will keep a long term relationship with Hat Creek Farm and we love the breed so much we are going to keep the Yukon blood lines going. I will be purchasing a male from Jean in the future. Sorry for being long winded but Charlie is worth it! May Jean be blessed and Hat Creek Farm!